WALT OWENS’ NEWEST — THE BEST EXACTA SYSTEM ON THE MARKET! A Quick, Easy and Super-Accurate Method That Will Put You In The Exacta Driver’s Seat at Your Track!! Works For Trifecta’s,Too! You’d think that by age 92, a successful horseplayer like Walt Owen would be resting on his laurels — and he’s got plenty of laurels to rest on, that’s for sure. But ‘retirement’ has never entered the expert system-creator’s mind. He just keeps pumping out excellent methods of play, and his latest, Exacta RoundUp!, will put the frustrated Exacta player on top of a very tough game. If you thought hitting 40%+ of your Exacta wagers was just a pipe dream, think again. Walt knows that the real money can no longer be made on straight bets alone. 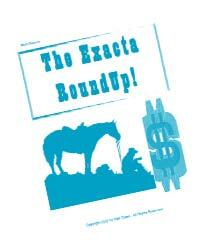 You’ve got to cash a decent share of Exotic Wagers, including Exacta’s and Trifecta’s. And Walt, ever the innovator, has designed an easy to use strategy (takes less than 15 minutes to figure your plays on an entire card!) that provides you with the logical Exacta contenders darned close to 50% of the time! AND NOW YOU WILL HAVE,AT YOUR DISPOSAL, EASILY ONE OF THE MOST REMARKABLE, MOST ACCURATE, EXACTA METHOD OF PLAY EVER DEVELOPED! seven $700+ payoffs and 15 $500+ payoffs. The average payoff will be closer to $230, but that ain’t anything to snoot at, either! Now, while the kind of results above won’t make you independently wealthy, we don’t know of any horseplayer who would complain about walking away with these kinds of profits for what really amounts to very little work and necessitates a very small starting bankroll. Obviously some tracks do better than others, but only a handful were on the ‘punk’ side and those were mostly short on the Trifecta side. Now one would think that Walt would want an arm and a leg for a system like The Exacta RoundUp, and we suggested that he charge in the $90 neighborhood. But Walt is from the old school, and has a difficult time getting used to today’s prices, so he went half that, and wants only $45 total, which includes First Class shipping.